Start zones will be in place at the start line of each race to ensure a smooth start for all runners. Entrants are asked to assemble in the appropriate zone as indicated by the letter printed on their race number (as chosen on their entry form). If you wish to run with friends or family who are starting in a different start zone, you may start in a slower zone than that printed on your race number (e.g. someone with a B Zone label may start in B, C, or D) but not in a faster one (e.g. A). Please be aware that anyone found deliberately running out of their designated start zone may be disqualified without a race result. Entrants are advised to assemble in their start zone 20 minutes prior to the race. Wheelchair entrants must start in front of the runners and will be started 5 minutes before the runners. The start area will be divided up into six zones for runners to assemble in. Seeded and priority start runners will be marshaled at the front of the pack with a seeded start zone (S) and a priority start (P) zone entrance gate. On their race number, seeded runners will be identified with their name in large print and a small number. Priority start runners will be identified with a small sticker affixed to their race number. For the remaining runners, the starting zone will be indicated by sticker with letter A, B, C or D on their race number. This will be based on their predicted finish time on their entry. These start zones will be signposted accordingly. Entrants are advised to assemble in their start zone 20 minutes prior to the race. The start area will be divided up into six zones for runners to assemble in. 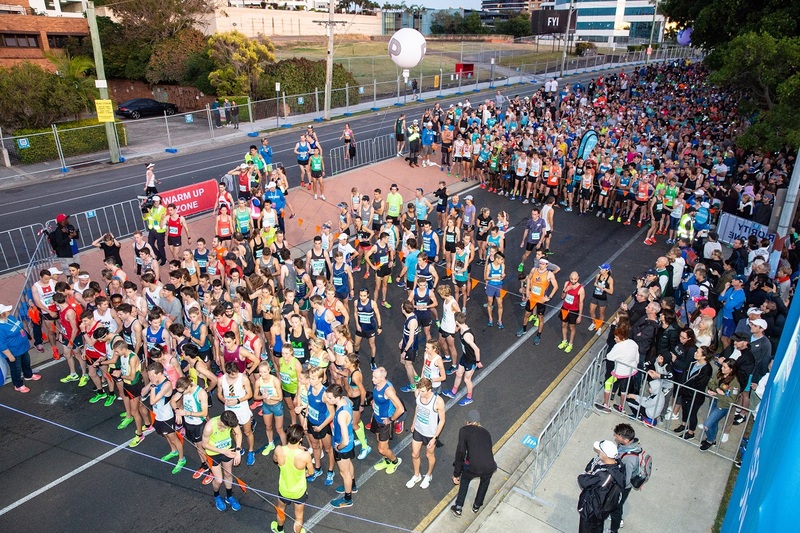 Seeded and priority start runners will be marshaled at the front of the pack with a seeded start zone (S) and a priority start (P) zone entrance gate. On their race number, seeded runners will be identified with their name in large print and a small number. Priority start runners will be identified with a small sticker affixed to their race number. For the remaining runners, the starting zone will be indicated by sticker with letter A, B, C, D or E on their race number. This will be based on their predicted finish time on their entry. These start zones will be signposted accordingly. Entrants are advised to assemble in their start zone 20 minutes prior to the race. The start area will be divided into 5 zones for runners to assemble. Seeded and priority start runners will be marshaled at the front of the pack in the first zone. On their race number, seeded runners will be identified with their name in large print and a small number. Priority start runners will be identified with a small sticker affixed to their race number with the letters SP. For the remaining runners, the starting zone will be indicated by sticker and letter A, B, C or D on their race number. This will be based on their predicted finish time on their entry. These start zones will be signposted accordingly. Entrants are advised to assemble in their start zone 20 minutes prior to the race. The start area will be divided into 3 zones for runners to assemble. Entrants will have the letter A, B or C on their race number showing which zone they have been allocated. This will be based on their predicted finish time on their entry. These start zones will be signposted accordingly. Prams are permitted in the Gold Coast Airport Fun Run but must start at the back of the field. Entrants need to indicate on their entry form that they will be running with a Pram to receive an access pass for the pram (prior to the close of entries on Friday 29 June). Please note that there is no charge for the child however if parents would like the child to receive the participant rewards then they must register and pay the entry fee. Entrants are advised to assemble behind the start line 20 minutes prior to their race.